The film narrates a fictional historical story set in the fictional provincial kingdom of Mahismati. The story starts off with queen Sivagami (Ramya Krishna) leaving a newborn child on the banks of river to save him from enemies. Some tribal people rescue the child and raise him as Sivudu (Prabhas). The story forwards to some years and Sivudu is now a youngster. At the same time in the province of Mahismati, King Bhallaladeva (Rana), a ruthless king who treats his citizens as slaves, has kept queen Devasena (Anushka) as a prisoner. Kattappa, who oversees the slaves, is loyal to Devasena but is helpless. Hiding secretly outside the kingdom, a warrior gang is waiting to free Devasena. One of the gang members is Avanthika (Tamannah). Sivudu who is bewitched by the beauty of Avanthika, wins her love with his heroic feats and promises that he would free Devasena. Who is Devasena, who actually is Sivudu, and more importantly who is Baahubali? Bahubali (2015) The film narrates a fictional historical story set in the fictional provincial kingdom of Mahismati. The story starts off with queen Sivagami (Ramya Krishna) leaving a newborn child on the banks of river to save him from enemies. Some tribal people rescue the child and raise him as Sivudu (Prabhas). The story forwards to some years and Sivudu is now a youngster. At the same time in the province of Mahismati, King Bhallaladeva (Rana), a ruthless king who treats his citizens as slaves, has kept queen Devasena (Anushka) as a prisoner. Kattappa, who oversees the slaves, is loyal to Devasena but is helpless. Hiding secretly outside the kingdom, a warrior gang is waiting to free Devasena. One of the gang members is Avanthika (Tamannah). Sivudu who is bewitched by the beauty of Avanthika, wins her love with his heroic feats and promises that he would free Devasena. Who is Devasena, who actually is Sivudu, and more importantly who is Baahubali? . Baahubali 2 Tickets Advance Booking: Baahubali 2 (The Conclusion) is most awaited and the upcoming historical movie released on 28th April 2017. Baahubali First Part got tremendous positive response and Peak Level reactions from worldwide, and now Baahubali 2 movie is here to make the Biggest Buzz once more. Sensational director SS Rajamouli directed this movie under the Arka Media Works banner. Which is produced by Shobu Yarlagadda and Devineni Prasad in the presence of Director K Raghavendra Rao. Entire Indian cinema lovers are eagerly waiting for Baahubali 2 Advance Ticket Booking/Baahubali 2 Pre Booking/ Baahubali 2 Tickets Online Booking/Baahubali 2 Online Ticket Booking. And one the more interesting thing is, this movie released in a 4K high Definition format. Bahubali the beginning is one amazing movie. High budget and very beautifully picturised. I advice every person to watch this movie atleast for the sake of visual effects. Words are noth enough to discribe it. Perfect characters and acting of each great actors and actresses are wonderful. Waiting for the second part to come. Great effort of the Director & his family. It is a Sunrise in Telugu movie industry. Good editing, melodious music of course, not that much hit !! Beginning for High standard in Telugui industry !! DIRECTOR tried to extract the real action from the actors nearest to reality ! Budget is heavy !! All producers cannot afford such type of budget, and it is also not advisable, in such a country like India !! We have to encourage low budget pictures very much !! Mind Blowing and Fantastic Telugu Movie. nThanks for S.S.Rajamouli Sir for making History to Telugu Film Industry!nnRamya Krishna's acting was marvelous as Shivagami Devi. No words to say about Prabhas and Rana's roles and their acting, simply awesome. Grand Yet Incomplete! 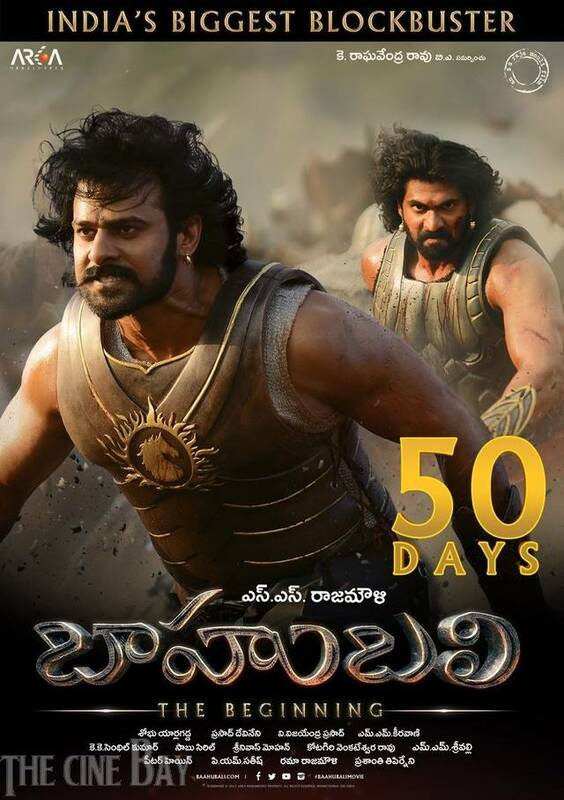 Baahubali Is An Attempt To Up The Ante And Take Telugu Movies To A Higher Level. Please.. Verdict: A Visual Feast, 'Bahubali' Is Not Rajamouli Enough. The Hollywoodish Ending May Well Be A..
Bahubali-The Beginning Isn’t Quite Finished; Though It Concludes On A Delightfully Stupefying Note. The..
On The Box Office Front, Bahubali - The Beginning Will Surely Shatter The Records Irrespective Of Its Weak..
All In All, 'Baahubali' Is A Money Machine And It Sets The Bar So High That People Couldn't Even Dare To..
Aahubali Is A Must Watch For Its Grandeur And Is Definitely A Movie To Experience In Theaters. However, In.. Visual Spectacle With Weak Climax, Visually Stunning! "Baahubali - The Beginning" To..
Baahubali The Beginning At Busan..
Varahi Movie Taking Part In..
Watch Bahubali Press Meet On Anti..